Even I have to say, hot damn. 🙂 Scarlet is a lucky, lucky boy. The cover artist is Arianne Elliot, who created the beautiful Scarlet & Liall fanart last year! I was so impressed with her work. Hope you all are too! 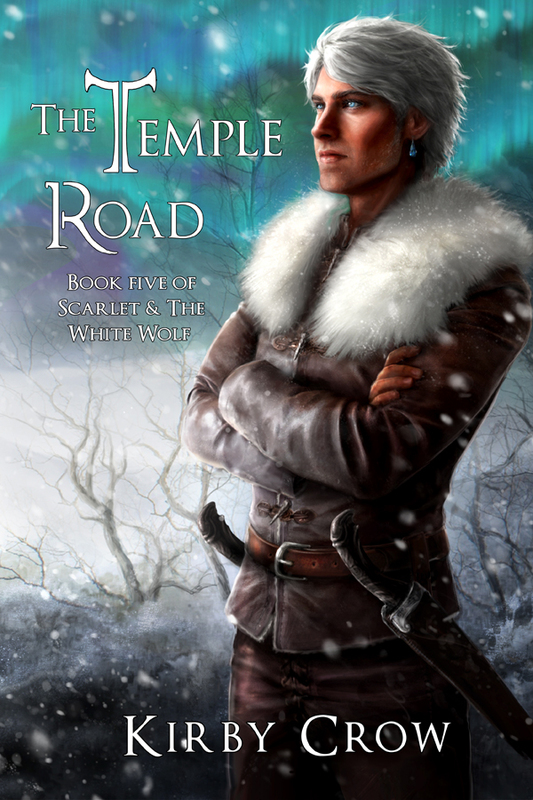 In The Temple Road, Scarlet and Liall set out with the king’s army on a perilous journey to the frozen heart of Rshan. Although Liall is determined that nothing will ever part him from his beloved Scarlet, treason, death, and a terrible betrayal soon push him to his breaking point. When Scarlet’s magic suddenly turns lethal, Liall places their entwined fates into the hands of those who covet magic above all else, but will they save Scarlet or enslave him? *Release date of The Temple Road will be announced at the end of January. Subscribe to my blog in the form below to stay tuned for future news (I know the text box is white, I’m fixing that today, sorry for blog weirdness! ), and thanks for reading. <3 Love you guys! This entry was posted in SatWW, Writing. Bookmark the permalink. Beautiful cover! Can’t wait to read this!! Any Update on a release date yet?